There are several common struggles that artist have when it comes to creating a finished work of art. Stopping before the artwork is finished - This may happen because you become discouraged with the direction or look of the work. You may also struggle with what to do next or maybe you just get tired of it and quit. The end result is often a lot of empty, unused paper. Other indicators that the artist quit before the work was complete are the lack of strong contrast, a limited range of values, or just the feeling that something is missing. The solution to this is to finish everything you start and to check for contrast and value before declaring it finished. Overworking a piece after is already finished - Leonardo da Vinci said "Art is never finished, only abandoned.” There are always things the artists thinks would make the artwork look better or things they feel they need corrected. This is especially a problem for the perfectionist. Many good artworks have been ruined by an artist that kept working after the piece was finished. 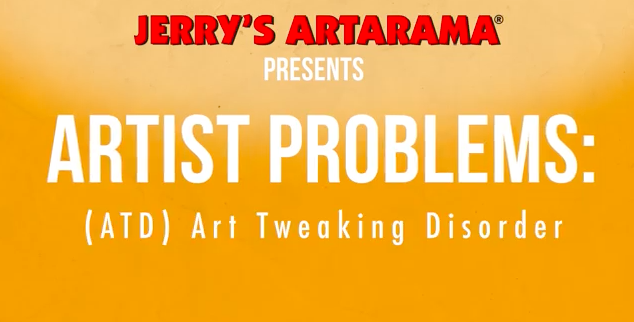 Click on this link to watch the video "Artist Problems: Art Tweaking Disorder"
Here are my three guidelines I use to help me know when I am done. I hope some of these might be helpful for you. 1 Your Art is strong up close and far away. Your finished art not only looks strong from across the room but as you approach and get closer, it should also remain strong. The “loud conversation” – the bold marks, the high contrast of light and dark patterns – can be seen clearly from far away. These bold marks should be equally balanced by more subtle, minimally contrasting marks – “the quiet conversation” – that are only noticeable as the viewer gets closer to the artwork. Both views should be satisfying. 2 You have taken Risks to get there. Sometimes I am trying to be done mostly so I can just feel done. However, stopping for this reason alone is never satisfying for the long term. Within a few days or even hours, I just know I needed to do more, push further even though that is hard sometimes to admit to myself. Like doing perfect swan dives off the low board, instead of the high dive, it just doesn’t quite feel up to par. I only consider stopping when I have pushed into an area that feels different or new. I want to feel the aliveness that comes when you are participating in something entirely distinct. This work then becomes a little like a doorway leading to the next paintings, even though they are not even made yet. I look for that spaciousness, that embedded potential in all my finished paintings. If it is not there then I know I have not gone far enough. Looking back at the arc of my work I see now that my best work, the work that still holds something for me, seems to show more of who I actually am. These paintings are more holistic in this regard. In other words, you are not necessarily just showing what you can easily do, but also being truthful and allowing the work to show where you struggled, where you are unsure. There is a always a degree of vulnerability with showing the good along with the bad, but I have found its presence makes for much stronger artwork. It somehow feels more truthful, more complete. It allows you to finally stand back and feel certain that this time, in fact, you are done.